When wine maker Ernst Storm told me he was slaughtering, butchering and grilling a lamb himself in Santa Ynez wine country to feed all his friends for his birthday, I was in. This would be amazing. “It’ll be legend,” Ernst told me. I made sure to arrive right on time, knowing I’d be among the first, so I could see the meat grilling up close. The guys had brought a big industrial barbecue grill, the kind with big wheels you crank to move the meat closer or further from the fire. On it were shining smoking piles of meat: whole chickens, beef tri-tip and lamb leg, loin and shoulder. “Wow!” I said, eyes wide. “Legend,” Ernst admitted in his lilting Cape Town accent, nodding soberly. Ernst humbly offered us glasses of his Storm Wines. As friends arrived, they brought bottles of wine from Curtis Winery in Foxen Canyon and Coquelicot Wines in Los Olivos, as well as perfect loaves of sourdough bread, organic vegetables and salads galore. Two guys drove up from LA to bring the best Burrata in the city – served over a bed of roasted cauliflower, broccoli and radicchio with marinated currants – and Paul’s BBQ Sauce, made by the perpetrator himself in his own garage in Venice. For dessert; huge locally-grown strawberries, bursting with flavor I only remember as a child. 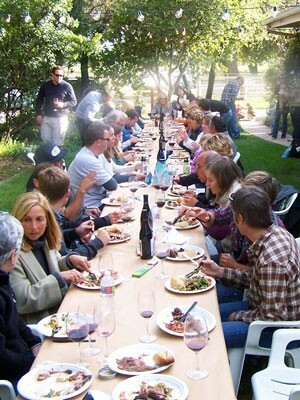 Sitting down to the long table in the garden to that meal and collection of wines was one of the best experiences of the season. It felt a bit like the Last Supper painting, but with a Santa Ynez Valley vineyard backdrop. Which decidedly made Paul, by location, the King – of BBQ sauce. Indeed if Jesus made BBQ sauce, it would be this. And the meat/wine/company was legend.